2/21/2016Share this story on Facebook! The Organic Growers of Ithaca College is a student-run organization that has maintained and improved the organic garden year-round since 2008. The students engage in sustainable gardening practices and organize workshops to educate the Ithaca College community on food issues. IC students definitely aren’t afraid to get their hands dirty in nature’s classroom. This year, two courses have begun using the on-campus organic garden so that students can discover for themselves the process of growing food. In Globalization of Food, sociology professor Bhavani Arabandi teaches skills like growing, weeding, and harvesting. Students then connect with community organizations to deepen their understanding of local and global food issues. 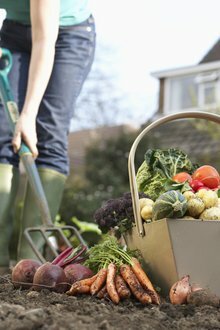 Food and Society, a health course, also teaches students how to harvest and cook produce from the garden. Back in the classroom, students use their garden experience to examine how human food systems have evolved. “Community gardens and farmers’ markets provide more to communities and individuals than just food…they also fulfill social, psychological, and cultural functions,” professor Julia Lapp said.